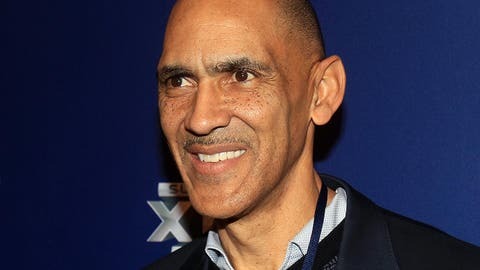 Tony Dungy was the target of a hoax, but got the last laugh. A man who fancied himself the Julian Assange of sports media has found out the hard way that messing around with big-name coaches and then bragging about it – using his real name – to Deadspin is perhaps not the best way to change the world. Kenneth Tarr, 32, was arrested Monday on suspicion of felony eavesdropping by the Los Angeles Police Department’s Hollywood Division detectives, according to NBC News. Police are accusing Tarr of recording phone calls he made to major sports figures without their consent. The case is likely to be helped by the fact that a man calling himself Kenny Tarr wrote Deadspin in October bragging about hoaxing Tony Dungy by offering him the head coaching job at the University of Southern California. He said he’d also tricked Golden State Warriors coach Mark Jackson, Minnesota Vikings coach Leslie Frazier, Chargers offensive coordinator Ken Whisenhunt and several college football coaches, and he promised he’d be back at it again soon. Well, in California it is illegal to record someone without his or her permission, and Tarr now has to answer for the calls he made to "at least a dozen coaches," offering them jobs or just messing around. Tarr told KNBC in November that he was on the "new frontier of broadcast journalism and sports media." "I’m like the world’s most safe criminal," he said. He may be a real criminal soon. Los Angeles police say they worked on the case for two months and had help from NFL investigators. Charges could be filed as soon as Wednesday, according to NBC, and Tarr is being held on $20,000 bail.